Every summer since 1990 young people aged 4 through 11 have had the opportunity to enjoy guided explorations the Boreal Forest, Farm Fields, Seasonal Ponds and other wetlands at Creamer's Field designed especially for them. Through outdoor activities like sensory exploration, discovery hikes, ecology-themed games, songs and creative craft projects, young people learn about the ecosystems of Interior Alaska, the home of most of our participants. Camp Habitat helps youth discover what makes where they live special! All sessions are taught by skilled instructors and assisted by junior counselors. Instructor to student ratios average about 8:2 for pre-school programs and 10:2 for older children. 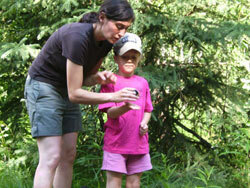 Throughout the week, guest specialists share their knowledge on insects, farming, forests, and other hands-on subjects. 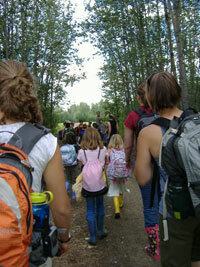 Youth learn about the ecosystems of Interior Alaska, including the people, plants, and animals that call Alaska home through games, crafts, songs, hikes, and growing food in the Creamer's Garden. All curricula are designed to be developmentally appropriate. For More information and to register please visit the Friends of Creamers Field Website.